The Board of Directors of Fierté Simcoe Pride includes individuals who are committed to the LGBT+ community of the Simcoe County area. Members are residents or professional workers of Simcoe County. Official elections are held each year at the Annual General Meeting (AGM). Preference is given to individuals who identify as LGBT+ or allies. Other community members who are interested are able to volunteer or participate through sub-committees. ​To learn more about founding members, including the founding chair, please visit the Founder's Circle page. The following members were elected at the Annual General Meeting on Satuday, March 25, 2017. Brandon Rhéal (they/them pronouns) is a post-secondary student involved in community work, and activism. Growing up in Simcoe County for most of their life, they have been an avid volunteer and advocate for the past eight years, involved in initiatives focused on education, youth, diverse communities, and intersectional causes. In 2010, they launched a anti-bullying campaign called Born This Way Day. From this, Brandon joined in the founding of Fierté Simcoe Pride. In secondary school, they were involved in various student clubs ranging from student governance and the GSA to the arts and mental health. They served as a Student Trustee on the Simcoe County District School Board from 2013 to 2014. With FSP, Brandon has served in several roles: Youth Representative (2012-2013), Secretary (2013-2017), and Co-Chair of the Awards Committee (2015-present). Brandon previously served on InterPride as the Regional Director for Canada (2016-2018). J. Andrew Baker (he/him pronouns) is a educator, community worker, counsellor, fire dancer, holistic health specialist, fundraiser, writer, and activist from Simcoe County, Ontario. For the past 19 years, Andrew has focused his career and volunteer work on community development, the environment, language and culture revitalization, the arts, life-long learning, holistic health, and spirituality within Indigenous and LGBT communities. In 1998, he began to work within the LGBT community as a volunteer and member of the AIDS Committee of Simcoe County’s (ACSC) Youth Outreach H.O.P.E. Theatre troupe. He served on the Board of Directors of the ACSC from 2009 to 2011 as a director; he served as the ACSC’s Board of Directors’ interim chair (2010) and chair (2010-2011). He worked as the Rainbow Health Ontario Community Outreach Worker for the North Simcoe Muskoka Region from 2008 to 2014. He is a founding member of the Simcoe County LGBTQ Network. He is the Vice President of Governance for Fierté Canada Pride, an active board member of Muskoka Pride, the LGBT representative on the Simcoe County Suicide Awareness Council, and a member of InterPride's Solidarity and Human Rights committees. 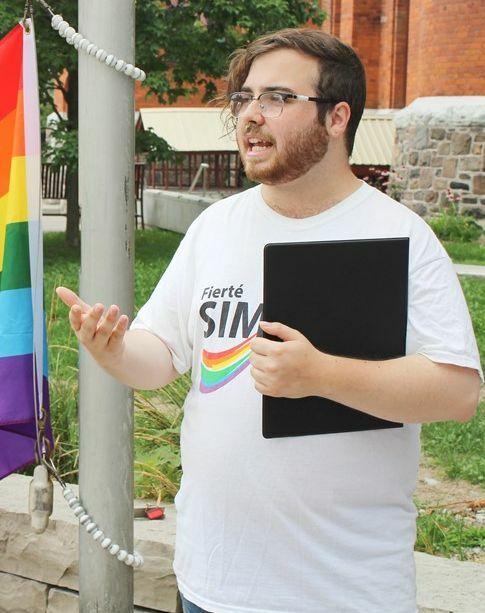 A Georgian Alumni of the Aboriginal Community and Social Development program at Georgian College in Barrie: where he served as Student Director of Aboriginal Studies (2008-2009), the Orientation Team Leader – Team Development and Training, and co-founded the Georgian LGBTQA Association (now operating as Georgian Pride). He was a researcher and graphic recorder for the Aboriginal Health Initiative: the Indigenous Voices Café community-based research project that resulted in the launch of the Aboriginal-Stream Pre-Health Science Certificate program. Andrew was an active member of the Anishnabe Education and Training Circle at the college from 2009 to 2012. Since 2012, A faulty member and curriculum development officer at Georgian College for the School of Liberal Arts & Access Programs, the School of Aboriginal Studies and the School of Health and Wellness. Baker is a program lead for employment and training initiatives at the Georgian Bay Native Friendship Centre in Midland, where he established 6 programs and projects. Keegan Hobson (he/him pronouns) is a post-secondary student who is active in his local communities through activism, volunteer work, community outreach and workshop facilitation. With an emphasis on at-risk queer and trans youth and utilizing harm reduction approaches, he is passionate about 2SLGBTQI+ rights, mental health advocacy and Indigenous movements. Joining the Board of Fierté Simcoe Pride in 2016, he has worked alongside Georgian Pride as their Social Media Director and as a Board member of our neighbouring organization, Muskoka Pride. Keegan is an alumnus of the Aboriginal Community and Social Development program at Georgian College, and is now attending Ryerson University in Toronto for his Bachelor of Social Work with a minor in Disability Studies. First elected to the Board in 2016, he has served as the Regional Representative for Barrie in 2016, Vice Chair since 2017, and Secretary since 2018. Jason Hurdlen (he/him pronouns) was born April 13, in the year of our lord Nineteen-Hundred-Seventy-Eight. He was born before the Friday the 13th Movie series was announced and bears only a few resemblances to Jason on those days, especially when his birthday actually falls on Friday the 13th. Avid volunteer and do-gooder, he is a big brother mentor volunteer, and has facilitated queer youth groups in the past in Mississauga. He was first elected to the Board at the 2013 Annual General Meeting. ​Jason was appointed as Co-Chair of the Awards Committee in 2015, and the Vice-Chair as of 2016. Jennifer (she/her pronouns) having been blessed with wonderful children, a loving spouse, and a fantastic career as a pastry chef, tries to express gratitude each day by helping the less fortunate and striving to be a kind person and advocate for causes close to her heart. ​Whether it’s “shopping local,” cooking for the homeless or mentoring at risk youth, I try to incorporate good deeds into my daily life. In my spare time I love to enjoy beautiful Georgian Bay (often with my kayak), a picnic and a huge stack of books, and I’m always up to hosting a backyard party! The skills I have learned from various communities including the Aids Committee of Windsor, Toronto and Barrie, Youth Haven and 4H Ontario will hopefully be helpful as I join the LGBTQ family at Fierté Simcoe Pride. Shirleen (she/her pronouns) has spent much of her life in Simcoe County and joined FSP in 2017. She is passionate about social work, and having earned her Diploma in Social Service Work from First Nations Technical Institute (FNTI) is now working on Beausoleil First Nation (Chimnissing). ​Sharon Marks (she/her pronouns) is the owner and creative director of Two Roads Marketing Inc. and has over 25 years experience in the design and marketing fields. ​After many years helping global Internet and media companies develop and implement their marketing strategies, she decided to bring her expertise to entrepreneurs who are driven by their passion to share their products and services with the world. In the past 15 years, Sharon has created online marketing strategies, social media campaigns and websites for a wide variety of businesses. ​Sharon has been a passionate volunteer in the arts but has been looking for a way to serve her LGBTQ+ community. She is excited to join the board of Fierté Simcoe Pride to assist in creating safer spaces and awareness. Sharon joined the Board in February 2019. ​Lennox LePage (he/him pronouns) is a post-secondary student, parent and local activist. With roughly 6 years experience, Lennox has sat as both a Board member and President of our neighbouring organization, Muskoka Pride. He is currently a student in Georgian Colleges Honors Bachelor of Business Administration and working full-time with the YMCA of Simcoe/Muskoka. He is passionate about harm reduction, decolonization efforts and facilitating braver spaces. ​Lennox joined the Board in February 2019.